You know Shadowgate for the NES, right? As it was originally written in English, it received a translation to Japanese. Well, turns out the Japanese translation was hilariously, infamously bad. 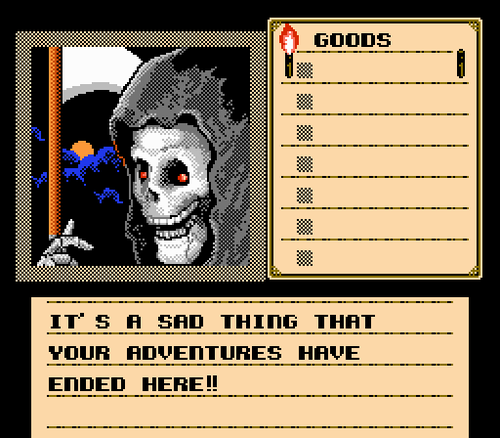 This is a ranking of the beautiful deaths the protagonist of Shadowgate, the hero of royal blood, can meet on his adventure. Of the many ways to die, I have exercised much scrutiny to select only the highest-class ones. I encourage you to see these for yourself. Shouting a battle cry, you catapult yourself off the platform. You are brave, warrior, but stupid!! Your body explodes as you plunge into the lava. * No one really has any clue what this means. Apparently it's a pun on Olympic athlete Carl Lewis and "karui" (light) from some advertisement...? You thrust the sword into your chest! Blood begins to flow! Suicide won't help in your quest. I thrust the blade of my sword into the left side of my chest. The blood is pouring out! Ahh! How foolish! To think I would myself put an end to my own life!! Similarly, nothing more needs to be said. As you move the pot, you realize that you have fallen for the oldest trick in the book. You suddenly find yourself knee-deep in the moat. It seems that the alligators really enjoy your company!! How ridiculous! As I approach the golden pot, the floor suddenly begins to crumble beneath my feet. It couldn't be! How? Why? Caught unawares, I plummet without resistance. When I come to, I am in a deep swamp. Before my eyes are mighty alligators!! I am cruelly made to be their feed! A broken fragment of a wooden ladder hangs from the opening. As you go down the trap door, you realize you took a big step. The fall is quite fatal. I descend into the darkness via a ladder. With a cry you jump to your death!! It takes only a couple of seconds before you hit the bottom with a thud. "GYAAAHH!!" I leapt while giving a yell. As I headed into the ravine, what did I see before me but...!! The reaper! He's waiting there as if to catch me. I can't help but love a hero that will give himself up for the player's sake. And of course, high marks for yelling as he leaps. With a mighty leap, you jump head first into the well. On the way down, you see no water below. The well was deeper than you imagined. You have just broken every bone in your body. Ahh!! The rope came loose! Hah! I reflexively reached out my hand! The motion makes me slip and tumble headlong into the bottom of the well!! The well was deeper than I thought. I... broke all my bones and died. The masterful use of language places it among the greats. But even so, quite foolish. A hero can't be seen slipping and falling into a well. The oil quickly catches and sets you on fire!! There is no way to put the fire out once it starts. You will be burned to the bone!! I hold my nose, and leap into the oil. There's much flavor to the wording, and I'm a fan of the quickness of it all. You try to pass the slime but it engulfs your body, dissolving it in seconds. ...You die instantly. No pain, no nothing. You were slimed. A-Ahh! In a flash, the slime gulps down my body. I obtained a one-way ticket to Hades. I have to admit, it's the wording that wins me over. It's not the way an ordinary person would speak as they died. The special thinking of a hero is on full, glorious display. You have opened a magic portal into deep space. You are immediately sucked through. The lack of air causes you to quickly lose consciousness. The Grim Reaper quickly embraces you!! A futile scream! My body floated in space. Thoughts of completely unrelated things raced through my head. My final sight was the vague twinkling of a star amid the darkness. What do you say to that wording...? This is not just any artist at work here. Such poetry, hero. I let out an unconscious sigh. Not to mention one would be unlikely to see this playing normally. Truly a precious treasure. Your torch goes out with a fizzle. With out-stretched arms, you move slowly, looking for a light. Suddenly, you trip over something!! Smash!! You fall face first to the floor!! Ahh! The fire... My last flicker of hope went out. It's dark! Pitch dark as far as I can see! I went fumbling in search of a light. Gong! Just then I slipped, and slammed forcefully into a wall.